The storms that have wreaked havoc on the coastline combined with thawing permafrost mean Barrow and the North Slope could look very different in coming years. "Moving forward and planning out the next 20 or 30 years, understanding erosion rates and thinking about either building some fortification on the beach or starting to move the community inland are big questions that we're going to need to answer," said Lars Nelson, general manager for the Ukpeagvik Inupiat Corp. lands department. A multi-year, interagency mapping project this month culminated in the launch of an information hub on coastal change in the area that scientists and researchers hope will help the community be more prepared for what's to come. "Maps transcend both the cultural and language barriers and help a community to communicate graphically and visually the threats and changes that they're seeing as a result of climate change," said Allison Gaylord with Nuna Technologies based in Homer. The main portion of the project began in the early 2000s but has been funded in recent years through grants from the Coastal Impact Assistance Program and the National Science Foundation. "We realized that we could help the community of Barrow by providing them tools for sustainable community development," explained William Manley, a research scientist with the University of Colorado Institute of Arctic and Alpine Research. The project is called the Barrow Area Information Database and it includes four applications that are the result of years of mapping and research compilation. There is the Imagery Time Viewer app, which allows the user to overlay images of various times in Barrow's history to see how the area has changed, shifted and been built up over the years. The Coastal Erosion Viewer app explores the effect storms and seas have had on the coastline, including on roads, coastal development and land use. The Community Planning Tool app helps users input information they want to consider in planning development for a particular area. Base maps that include wildlife habitats, land ownership boundaries and wetlands could help developers decide where and how to build. Finally, the Research Sites Viewer app shows ongoing research projects and their purposes in the Barrow area. By looking at how the land has changed over time, researchers can better predict what change will come in the future. "We could give them information about wetlands that could be considered as part of permitting and planning," Manley said. "We could give them a way to look at how the village has grown and changed over time, how the surrounding environment has changed over time, and look at how the coast has eroded over the last several decades. So we're hoping these tools, now that they're done and freely available and online, will be used to help with making decisions for future growth and prosperity of the village." To collate this much data, project participants had to bring together a plethora of stakeholders to share ideas and information. An advisory council, made up of representatives from the Arctic Slope Regional Corp., Ukpeagvik Inupiat Corp., the North Slope Borough, the city of Barrow and the Native Village of Barrow helped guide the process. Mapping Ukpeagvik's lands was one of the prime objectives of the study, and to do that, a team of students and a geographic information systems (GIS) technician surveyed more than 80 miles of coastline over a three-year period. "Out on the nuna, (I used) the traditional knowledge that I learned from my family," said Qaiyaan Aiken, the technician who led three graduate students from the University of Texas on expeditions. "For generations, we've hunted and subsisted off these lands. The background I had was the knowledge of getting to certain places." Near the end of the project, Aiken was hired by UIC's lands department as a project administrator. Training locals to be able to take on more responsibilities for this kind of management in the future was one of the goals of the project. "Originally, when we were writing the proposal, we saw a real opportunity to take data and information that typically would be collected and would stay within this realm of the scientific community and make that available and interactive to local planners," said Craig Tweedie, an associate professor in the biological sciences department at the University of Texas, El Paso, and director of the science and engineering program. "This is fairly unusual collaboration that we have here. It's something quite special, I think. Right from the get-go, it was really a vision that this project would be just a stepping stone to something longer-term." The data has already been used in evaluating the potential for relocating one of the most important roads for subsistence in Barrow, one of the practical applications of the coastal erosion app. Pignik has moved about 20 feet in three years simply because of coastal erosion and storms changing the line of the beach. "That road is a top priority for the borough and it's actually pushed the right of way out into the beach and the road is pushed onto private property, onto UIC land, which creates some problems with liability and whatnot," explained Nelson. "There are plans to reroute the road based on the erosion rate of the area, and this application actually helped us justify that with Federal Emergency Management Agency (FEMA)," he said. "The governor declared the 2015 storm a disaster, so they were eligible to apply for funding on that road. We're trying to get away from the high erosion spots there and plug the road in a little bit inland and this tool was helpful in justifying that." In addition to local planning efforts, the data collected over the course of this project will likely prove an invaluable resource for future scientists studying the area. "In the long run, I really foresee this being a very important baseline data set for long-term monitoring of wildlife, the hydrology of lakes and ponds and rivers in the area, vegetation change," Tweedie said. "There's a lot of indicators among those sorts of measurements that will also give us improved understanding of how the permafrost is responding to climate warming and how climate change and land use may be affecting some landscape units more than others. Having this baseline data set is a really wise investment for the future." 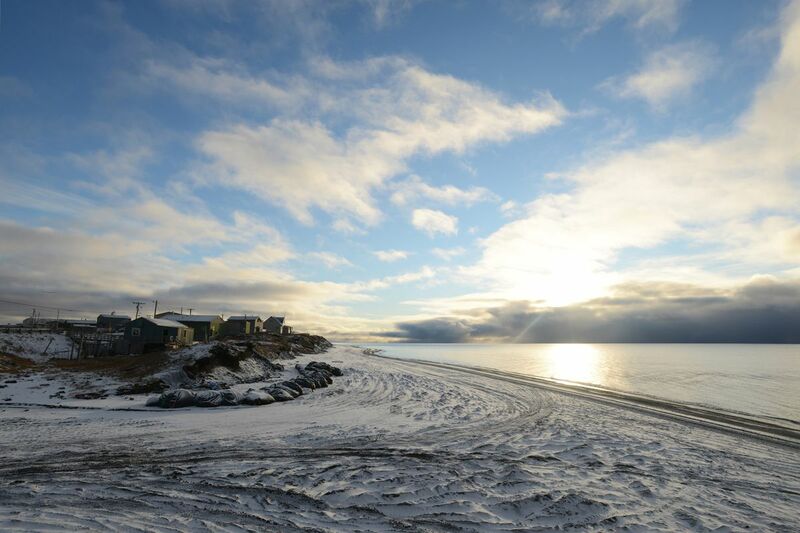 More than anything, the researchers who worked on creating this expansive database agree on one thing: Change is coming to the North Slope and it's up to everyone to help its communities prepare. "It's kind of a double whammy," said Tweedie. "You've got changes in the marine environment. You've got changes in the terrestrial environment. It's really this coastal zone that is kind of where these two worlds meet and it's where the majority of human settlements are located. The problems they're going to have to solve in the next half century are really quite monumental. It really is a huge challenge they've got before them."